Poor Bruce Carey. He's kinda like the A-student you loathed in Calculus class. 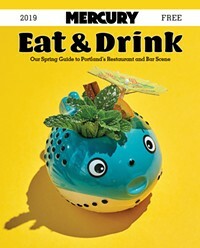 Not only is he the owner of Saucebox and the former Zefiro, the King Midas of Portland restaurants has been touching things again with the latest pearl in the Pearl--bluehour. Bruce doesn't suffer from the typical restaurant owner malady: great concepts, shoddy execution. And he doesn't insist on venturing into crazy, uncharted territory. He's simply successful at accomplishing what everyone has tried before. Take the scallops and bacon appetizer. Nothing you weren't served at the last wedding you attended--except this time the scallops are cooked just right: tender, slightly sweet, and matched well with salty, crisp bacon and a mysterious, tangy sauce. To its credit, bluehour refuses to go overboard with bells and whistles. In fact, the list of entrèes is downright plain. Food and cocktail presentation is smart but not overwhelming, just like the surroundings--swank but unadorned, bold without being imposing. Exhibit A: The simplest dish you can imagine--heirloom tomatoes and freshest ever mozzarella, punctuated with basil leaves and kalamata olives--is the highlight of the meal. Of course I can't resist a few nitpicks... my shoestring fries, though perfectly seasoned, were cold as ice! OK, I know they're hard to keep hot when they're so skinny, but don't make me fork over my whole paycheck and then insult me with cold food. And even though most of the servers were very personable, I smelled a few bad, snobby apples who seemed to derive pleasure from looking down their noses. But one bite of the French Pudding with Baci, and I almost forgot why it bothered me so much.